The druid’s class skills are Climb (Str), Craft (Int), Fly (Dex), Handle Animal (Cha), Heal (Wis), Knowledge (geography) (Int), Knowledge (nature) (Int), Perception (Wis), Profession (Wis), Ride (Dex), Spellcraft (Int), Survival (Wis), and Swim (Str). A druid can channel stored spell energy into summoning spells that she hasn’t prepared ahead of time. She can “lose” a prepared spell in order to cast any summon nature’s ally spell of the same level or lower. A druid can’t cast spells of an alignment opposed to her own or her deity’s (if she has one). Spells associated with particular alignments are indicated by the chaos, evil, good, and law descriptors in their spell descriptions. A druid’s bonus language options include Sylvan, the language of woodland creatures. This choice is in addition to the bonus languages available to the character because of her race. At 1st level, a druid forms a bond with nature. This bond can take one of two forms. The first is a close tie to the natural world, granting the druid one of the following cleric domains: Air, Animal, Earth, Fire, Plant, Water, or Weather. Druids also have access to a set of Animal and Terrain Domains. When determining the powers and bonus spells granted by this domain, the druid’s effective cleric level is equal to her druid level. A druid that selects this option also receives additional domain spell slots, just like a cleric. She must prepare the spell from her domain in this slot and this spell cannot be used to cast a spell spontaneously. Unlike normal animals of its kind, an animal companion’s Hit Dice, abilities, skills, and feats advance as the druid advances in level. If a character receives an animal companion from more than one source, her effective druid levels stack for the purposes of determining the statistics and abilities of the companion. Most animal companions increase in size when their druid reaches 4th or 7th level, depending on the companion. If a druid releases her companion from service, she may gain a new one by performing a ceremony requiring 24 uninterrupted hours of prayer in the environment where the new companion typically lives. This ceremony can also replace an animal companion that has perished. A druid who chooses to learn druidic herbalism can use combinations of nuts, berries, dried herbs, and other natural ingredients along with appropriate containers to create herbal concoctions or magic consumables that function like potions. This acts like the Brew Potion feat, but only for spells on the druid spell list. Herbal concoctions are typically thick and sludgy, and their creation time, caster level, spell duplication capabilities, and all other variables and properties are identical to those of potions created using Brew Potion. Herbal concoctions created with herbs that cause special effects when ingested retain those effects as well as the appropriate spell effect. A druid can create a number of free herbal concoctions per day equal to her Wisdom modifier. Additional concoctions cost the same as creating an equivalent potion using Brew Potion. Druids can sell their herbal concoctions just as if they were potions (though NPCs unfamiliar with druidic herbalism may need some convincing before purchasing these wares). 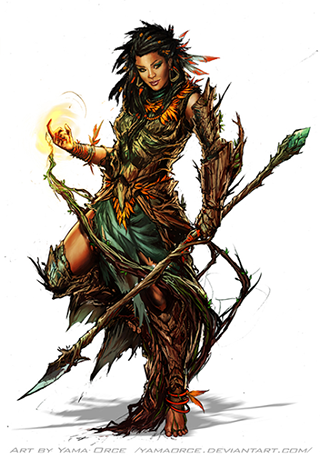 At 4th level, a druid’s increasing skill with herbalism means that she can disguise the effects of her herbal concoctions. When a creature attempts a Perception or Spellcraft check to identify one of the druid’s concoctions, the concoction appears to be a different herbal concoction of the druid’s choice unless the creature exceeds the identification DC by 5 or more. The druid must designate this false result when creating the concoction. If a creature exceeds the identification DC by 5 or more, it correctly identifies the concoction, though not that the druid tried to fool it. Additionally, at 4th level, when the druid creates additional concoctions, she need pay only half the normal cost to create them. It takes her only half the normal time to create her concoctions, and she can create concoctions of spells from any spell list, as long as she can cast the spell. At 7th level, when the druid creates concoctions with potential false identification results, a creature attempting to identify the concoction must exceed the identification DC by 10 or more to determine the concoction’s true identity. Additionally, at 7th level, a druid can create any herbal concoction in 1 minute. She can also create a special concoction of any spell higher than 3rd level that she can cast, but to do so, she must expend a spell slot of the same level. These special concoctions do not cost her anything to create and function like extracts created by an alchemist with the infusion discovery. At 4th level, a druid gains the ability to turn herself into any small or Medium animal and back again once per day. Her options for new forms include all creatures with the animal type. This ability functions like the beast shape I spell, except as noted here. The effect lasts for 1 hour per druid level, or until she changes back. Changing form (to animal or back) is a standard action and doesn’t provoke an attack of opportunity. The form chosen must be that of an animal the druid is familiar with.